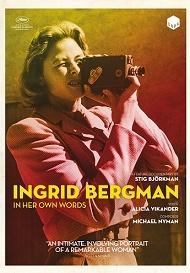 Ingrid Bergman In Her Own Words is released on DVD September 19. And to celebrate we have a great competition for you and 3 copies on DVD to give away. A captivating look at the remarkable life of a young Swedish girl who became one of the most beloved and celebrated icons of cinema. Utilising never-before-seen private footage, letters, diaries, and interviews with her children, this documentary provides a complex and intimate personal portrait. Oscar-winning actress and fellow Swede Alicia Vikander gives voice to Bergman's letters and diaries.